August 8, 2013 by Ecommerce News. About Cross-border, Statistics with tags Europe. 3779 views. 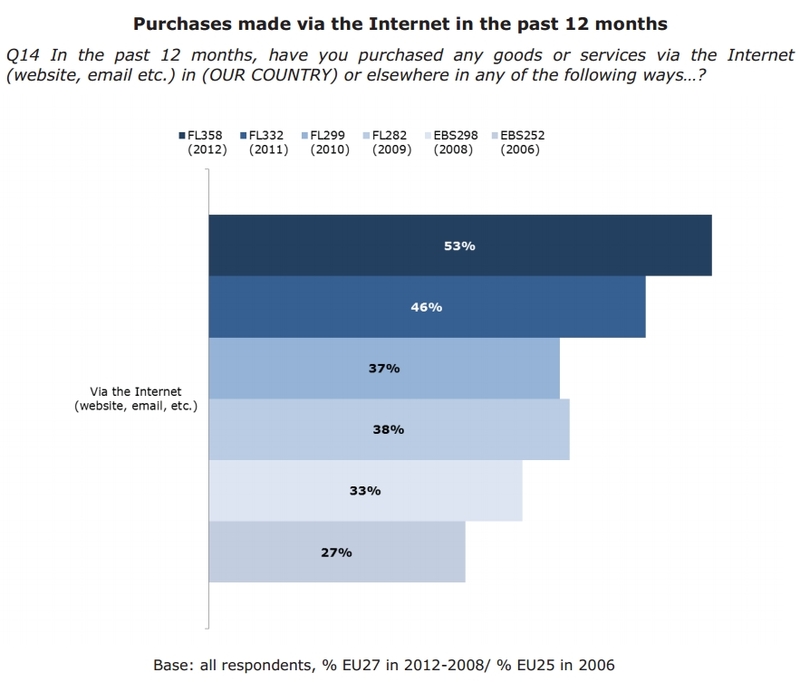 More than half of European consumers have made at least one online purchase last year. This percentage has almost doubled since 2006. The proportion of European consumers who make cross-border purchases has also grown, it has nearly tripled since 2006 to reach 15% last year. These are just two of the statistics we’ve learned about by digging into the interesting Eurobarometer report of the European Commission. There we’ve also read that although cross-border shopping is getting more popular, it still isn’t common for an European consumer to buy something online from a vendor in another EU country. Only one in three EU consumers feel confident about purchasing something via the internet from a a vender located in another EU country. But – good news – among people who have already made an online purchase, 80% are confident about cross-border purchasing. Among people who’ve never made an online purchase is lower (what a surprise!) Only 27% would feel confident about cross-border purchasing. Nonetheless, four in ten respondents are prepared to order goods and services online using another EU language and 32% knows where to get more information or advice about cross-border shopping. When asked about planned cross-border purchases, 26% responded with being interested in making a cross-border purchase within the EU during the next twelve months. When we look at the retailer’s side (pdf), we’ll see that most of the retailers only sell in their own language, 55% of the respondents do that. But there’s also a 45% of retailers that use at least two languages. One in eight retailers uses even more than three languages. One in four retailers participate in cross-border trade. Not bad, but it is a 2% decrease since 2011. The costs of adhering to all kinds of different consumer protection regulations and the possible increase in costs that are caused by fraud are the most frequently mentioned obstacles for the development of cross-border trade.